I am truly honoured by this opportunity to meet members of the Indian business community on my first State Visit to this beautiful country. As I have so often stated, Maldives and India have been friends since time immemorial. India is our closest neighbour. Our people are bound by ties of friendship, and cultural affinity. And within those close links, trade and commerce have flourished. Every year, hundreds of Maldivians visit India for a variety of purposes; from tourism to medical purposes; to seek an education; to meet old friends and to establish new ones. India hosts thousands of Maldivian students who cherish the opportunity to attend world renowned educational institutions; and learn from some of the world’s best doctors, engineers and technologists. India is not only our closest friend; it is also one of our largest trading partners. The economic success India has achieved since it liberalised its economy, nearly 25 years ago, is worthy of the highest praise. It is not my intention tonight to bore you with technical details about market sizes and interest rates. Nevertheless, I would like to emphasise that today, the Maldives is a fast growing emerging economy. We continue to develop our tourism industry; and we are making new investments in infrastructure development, ranging from harbour construction, to developing regional airports. We have near perfect capital mobility. In the Maldives, there are no obstacles to foreign ownership of investment. Our banking sector would, I am proud to say, benchmark amongst regional banks; and we are fully committed to providing the protection and legal cover that overseas investors need to develop their business in the Maldives. 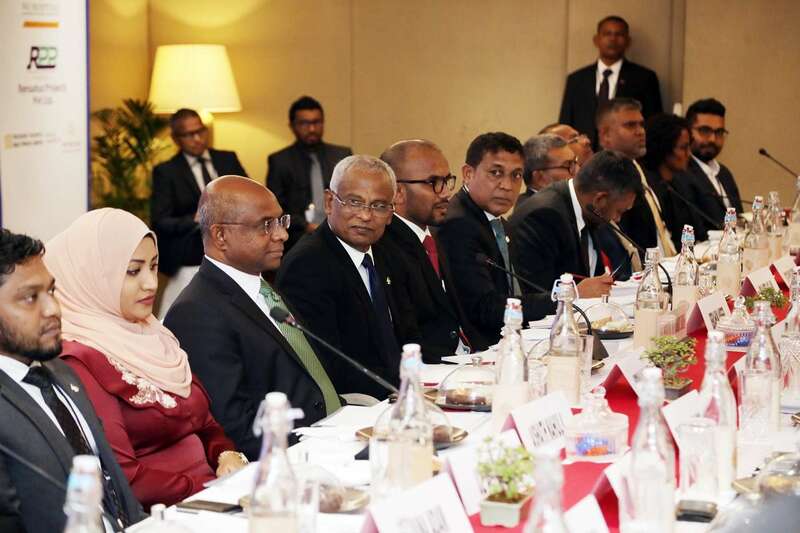 In short, the Maldives is willing, able, and open for business. With me here today, are the Ministers responsible for Finance, Economic Development, National Planning and Infrastructure, and Transport. A business delegation is also accompanying me on this visit. They would share with you in more detail the opportunities that await you as you consider investing in the newly emerging Maldives. May I, once again reiterate, how happy I am to be here this evening. It is indeed a great pleasure to have this opportunity to meet and interact with you this evening. I wish you all a wonderful evening and great success.